India’s upcoming general elections have the potential to increase attention to rural areas where the majority of voters live, according to the 2019 Global Food Policy report. As rural economy and festering agricultural crisis take centre stage ahead of India’s general elections, the 2019 Global Food Policy report advocates revitalising rural areas underpinned by symbiotic rural and urban systems as also rural business innovations. In a 2019 study, researchers have proposed a model to best utilise the available resources in an Indian village to generate self-sustaining livelihoods and achieve rural development using the concept of bricolage-constructing or creating something new by using combinations of resources already at hand. As rural economy and the festering agricultural crisis take centre stage ahead of India’s general elections, the 2019 Global Food Policy report advocates revitalising rural areas underpinned by symbiotic rural and urban systems. Marked by deepening cycles of hunger and malnutrition, persistent poverty, limited economic opportunities, and environmental degradation, the report by the International Food Policy Research Institute (IFPRI) says, rural areas continue to be in a “state of crisis” in many parts of the world, including in India where farmers are in distress. India’s upcoming general elections have the potential to “increase attention” to rural areas where the majority of voters live, according to the report, which throws its weight behind a ‘rurbanomics’ approach. Premised on rural-urban links, rurbanomics can spur growth and diversification in the agriculture and non-agricultural sectors, increase incomes, support value chain development, and improve well-being. “It is basically providing urban amenities to rural areas. These include ensuring electricity, hygiene, sanitation, drainage, better education and health facilities,” said Pramod Joshi, South Asia Director at IFPRI and co-author of the report chapter on South Asia. In India, several initiatives have been taken up in rural areas (such as rural electrification and improving connectivity by all-weather roads) but more needs to be done, Joshi said, adding agriculture needs special attention. “A holistic approach will help India to revitalise rural areas. 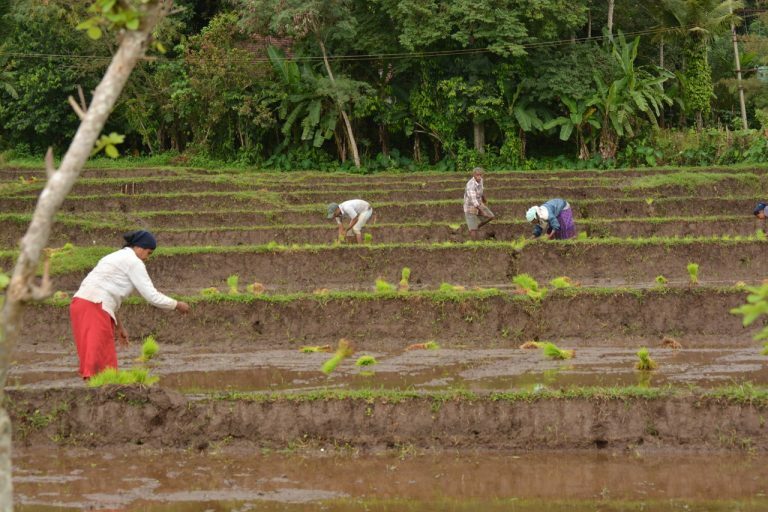 Efforts are needed to push demand-driven agriculture, ensuring financing agriculture, disseminating improved technologies, and creating agricultural domestic and export markets,” Joshi told Mongabay-India. Monsoon is the lifeline for agriculture in the country. Photo by S. Gopikrishna Warrier / Mongabay. “The region [South Asia] receives USD 132 billion (2018) as remittances. This may be channelled for investments in rural development. We must also promote climate-smart agriculture to reduce the risk of climate change,” added Joshi. Emphasising on rural business innovations, Joshi also echoed the report’s emphasis on the “vast potential” of rural pockets to become premier hubs of innovation in just under a decade, not only in agriculture but also in manufacturing and services, providing a means for many rural residents to move out of poverty, malnutrition, and a low quality of life, and perhaps even to stem the flow of rural-urban migration. So could concepts of ‘jugaad‘ (colloquial Hindi word for a frugal form of innovation) and bricolage (a word of French origin that means constructing or creating something new by using combinations of resources already at hand) fit in and support existing rural development schemes? “While ‘jugaad’ hacks may work in the short-term, they may not endure as a long-term solution. Concepts that utilise existing resources also help preserve natural resources. One may sometimes need some form of external input,” pointed out Joshi. In a 2019 study, IIT Bombay’s Ronita Bardhan and Ramit Debnath from the University of Cambridge, have come up with a model to best utilise the available resources in an Indian village to generate self-sustaining livelihoods and achieve rural development. They propose a model called ‘Resource Symbiosis’ developed using the concept of bricolage. The researchers applied their model on a village called Shingnapur in Maharashtra, which has about 920 households with agriculture as the predominant occupation. The authors claim that their resource symbiosis model can be customised and replicated in other villages based on their socio-cultural needs. It can also support current schemes like the National Rural Livelihood Mission and Integrated Rural Development Plan by leveraging the concept of bricolage, thus enabling policymakers for a fast-paced implementation of programmes for rural development. According to the Global Food Policy report, India has taken various measures to bolster the rural economy but the efficacy of the schemes would depend upon implementation. Bardhan said that India has about 18 schemes, all of which aim to generate means of livelihood, eradicate poverty and provide jobs with minimum guaranteed wages. 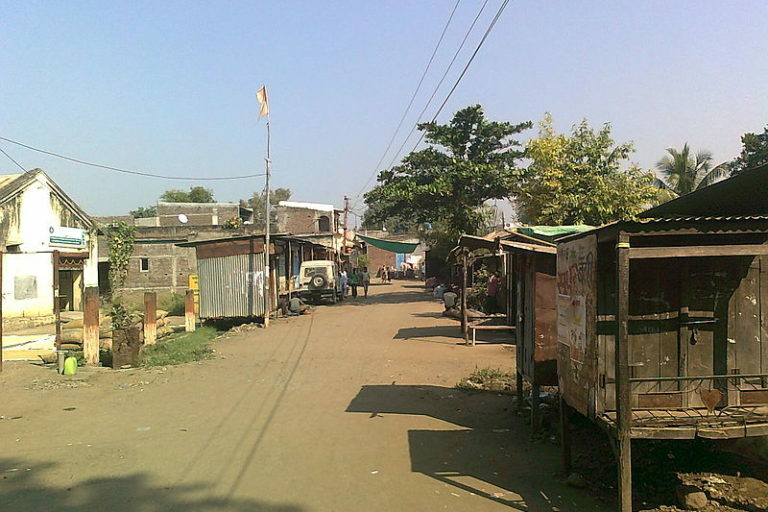 A village scene in Maharashtra. Photo by ABHIJEET/Wikimedia Commons. “Factors like fund mismanagement, unequal budget allocation among states, lack of awareness about the schemes and administrative negligence have hindered the successful implementation of these schemes,” Bardhan, a professor at Centre for Urban Science and Engineering, said. Self-help groups too have been ineffective in addressing the issues of rural development, she said. In the study site, they found that the village has entrepreneurial businesses, such as retail shops and public distribution systems, and small-scale industries like a milk-processing unit, amla (gooseberry) processing unit and mechanised farming. However, the villagers faced significant problems such as indoor pollution due to firewood usage, electricity thefts and irregular billing periods, open defecation, and agricultural water demand. Their analysis showed that the village could use its available resources to establish a soybean oil mill and a biogas plant that could function along with the existing milk processing unit. It could also benefit from bricolage by creating a market-based wealth generation system, where local entrepreneurs sell their produce from the amla and milk processing units in the local farmers market, produce soybean oil through existing soybean agriculture, and use the leftovers from the oil mill for biogas production, thereby achieving self-sufficiency and local empowerment. Women will play a central role in creating rural change—not only in addressing hunger and malnutrition but also by contributing to rural revitalisation more broadly if access to skills, resources, and political voice is more equitable, underscored the report. Echoing the same, food security expert Basanta Kumar Kar, said a national program and policy that envisages smallholder women farmers’ movement with value chain strengthening can be transformative in nature. 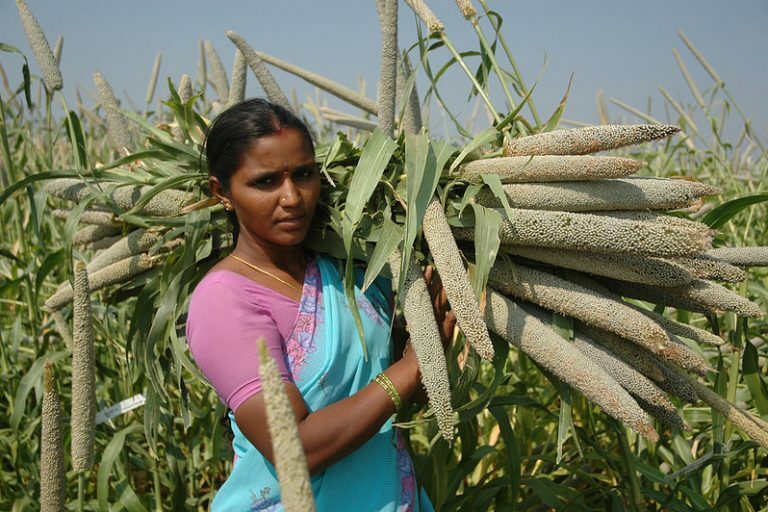 “Our initiatives should be guided by the belief that women play a strategic role in protecting food and nutrition sovereignty,” Kar, Country Director of Project Concern International, India, told Mongabay-India. While the Global Food Policy report touches upon the double burden of malnutrition, it needs to lay more emphasis on the subject, opined Raya Muttarak of International Institute of Applied for Applied Systems Analysis, Vienna. The dual burden of malnutrition is characterised by a concurrence of undernutrition along with overweight and obesity within the same individual, household, community, region and/or country. “Providing that household food security is closely linked to malnutrition, this raises questions about the implications of climate change on the dual burden of malnutrition,” Muttarak said in an editorial. Further, sanitation is actually a fundamental factor to achieve better nutrition, Muttarak told Mongabay-India. “This is highly relevant for India with income level picking up making India also a target from multinational food companies and expanding urbanisation expanding. The problem of overnutrition will exacerbate in India while undernutrition remains a big issue,” Muttarak added. Women will play a central role in creating rural change—not only in addressing hunger and malnutrition but also by contributing to rural revitalisation more broadly if access to skills, resources, and political voice is more equitable. Photo by ICRISAT. Banner image: Cassava being loaded from Kolli Hills in Tamil Nadu to be turned into industrial starch at units near Salem city. Photo by S. Gopikrishna Warrier/Mongabay.